Two late Victorian 18ct gold diamond and gem-set rings. 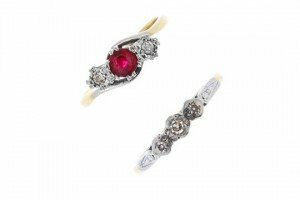 Each designed as a graduated ruby, red-gem and old-cut diamond line, one with scrolling sides, the other inset to the tapered band. A selection of three diamond and gem-set rings. 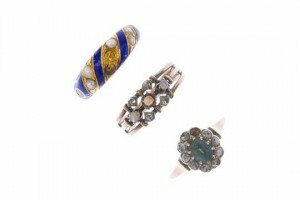 To include a late 19th century gold split pearl and spiral blue enamel ring, an opal and diamond openwork ring, together with a blue gem and rose-cut diamond cluster ring. Gems deficient. 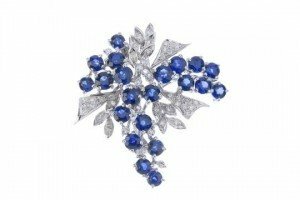 A mid 20th century sapphire and diamond brooch. The circular-shape sapphire floral cluster, interspersed with single-cut diamond foliate highlights. Two mid 20th century 18ct gold gem and diamond rings. 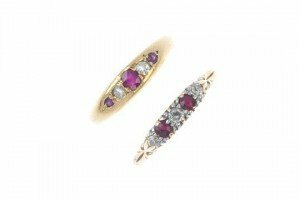 To include a diamond three-stone ring and a garnet-topped-doublet and diamond three-stone crossover ring. A pair of amethyst ear pendants. Each designed as an oval amethyst cabochon, within a filigree panel and surmount, connected by an oval and circular-link chain. A 14ct gold tanzanite and diamond dress ring. 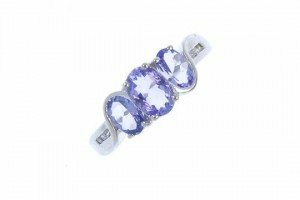 The graduated oval-shape tanzanite line, with brilliant-cut diamond shoulders to the plain band. A pair of 18ct gold diamond earrings. 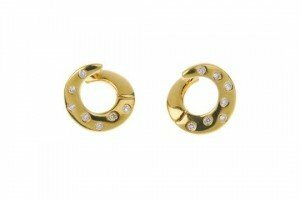 Each designed as a asymmetric hinged hoop with scattered brilliant-cut diamond accents. 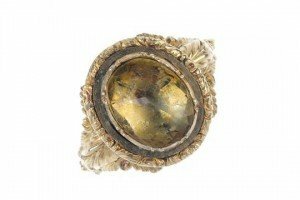 An early 19th century gold citrine ring. 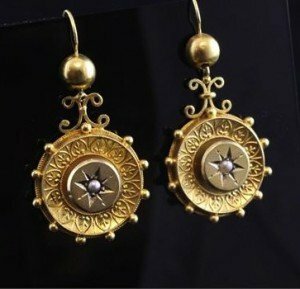 The replacement oval-shape citrine, within a foil-back setting, to the embossed scroll surround and shoulders. A ruby and split pearl necklace. 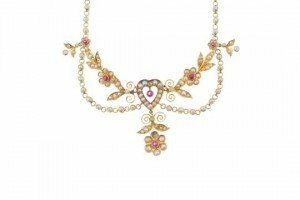 The floral and foliate garland, with heart-shape centre, set throughout with split pearls and circular-shape rubies, to the belcher-link back-chain. 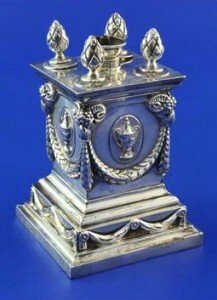 A Victorian silver club table lighter by Richard Hodd & Son, of plinth form, decorated with ram’s heads, swags and trophy cups, the top with central wick and four removable tapers with flambe finials. 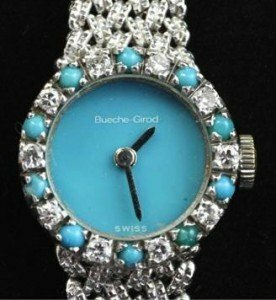 A lady’s 1970’s 9ct white gold, diamond and turquoise Bueche Girod manual wind wrist watch, with circular turquoise dial and gem set bezel, on integral Bueche Girod textured 9ct white gold bracelet. 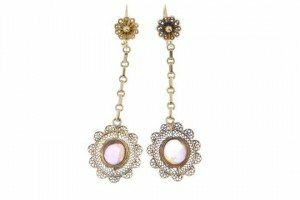 A pair of Victorian gold and seed pearl set drop earrings, of disc form, with scroll decoration and beaded borders. 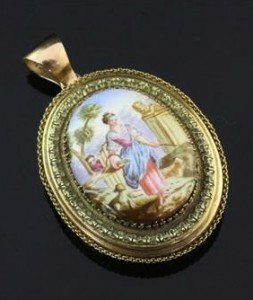 A Victorian style gold and enamel oval locket, decorated with a maiden tending to her sheep, with rope twist border. 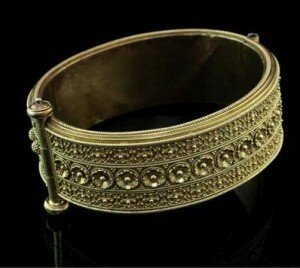 A Victorian gold hinged bangle, with continuous geometric cannetile work decoration and central bands of spheres and flower head motifs. 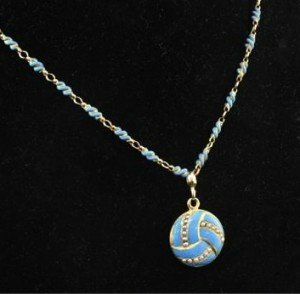 A Victorian gold, turquoise enamel and seed pearl set locket pendant necklace, of circular form, with overlapping design and enamel spiral chain. 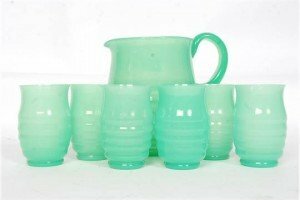 A stunning 1930’s Art Deco green ribbed glass lemonade set. Comprising jug and 6 beakers in a vibrant lime green colour. An oil lamp cast iron base with cut cranberry glass reservoir, with cranberry glass funnel. 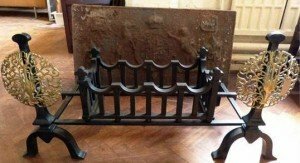 Georgian style cast iron dog grate with pierced decoration complete with back bearing a Cheshire coat of arms. 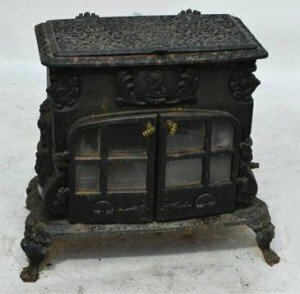 A cast iron shaped “gypsy” stove with pierced hinged top enclosing the hob, with hinged front doors below seahorse plaque decoration to front, raised on four ornate feet. 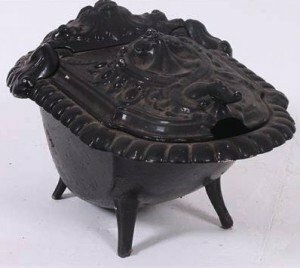 A 19th century French cast iron coal hod scuttle purdonium. Circa mid-19th The decorative ebonised shape surrounded by Rococo scrolls and anthemion leaf cartouche, shaped body on splayed legs.